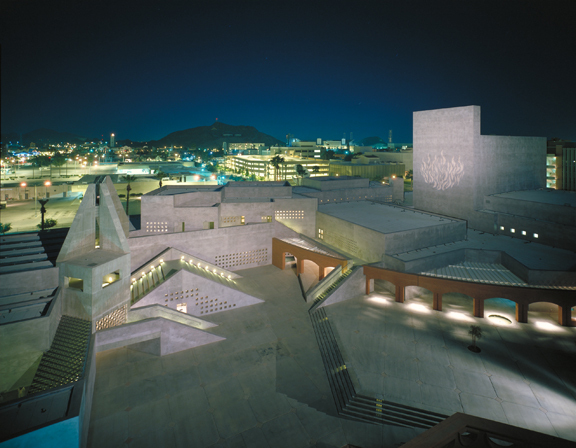 The design of the arts center, containing a museum, theater arts and dance departments involved a special attitude toward the desert - much more than simply imposing the building program on the quasi-urban university site. 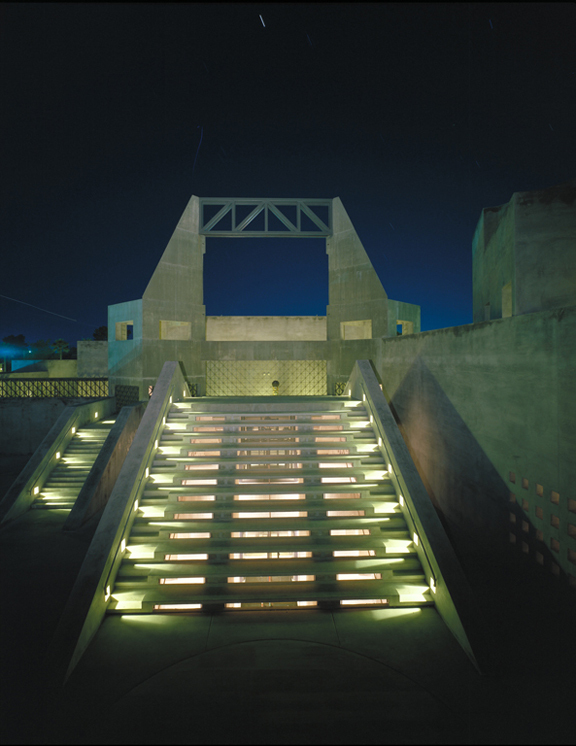 The harsh and relentless desert presence in Arizona is often denied; the prevailing tendency (in terms of development and attitudes toward public architecture) is to convert the desert into a midwestern oasis, to tame the desert. 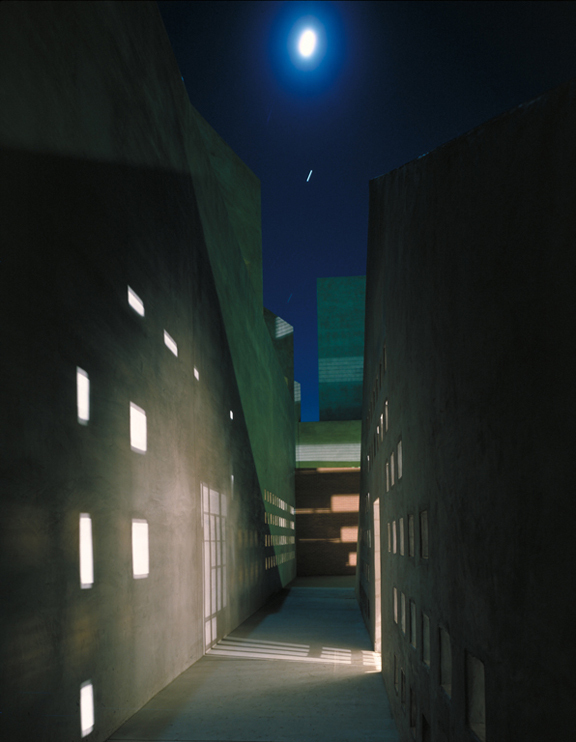 The building defines a journey, a procession; it defines options and potentials rather than particular paths. It is an open matrix of possibilities for engagement both vertically and horizontally. Art galleries extend the procession. 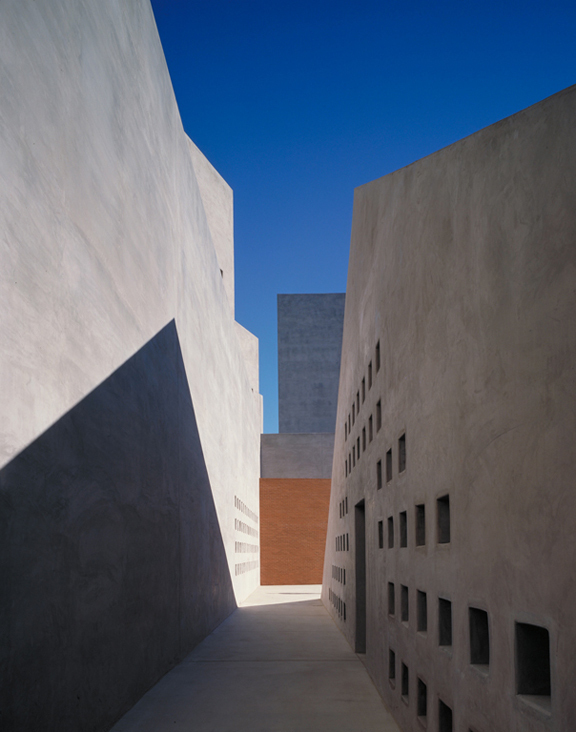 They are anchored by exterior terraces for sculpture installations. These terraces are partly shaded by steel-plate trellises. 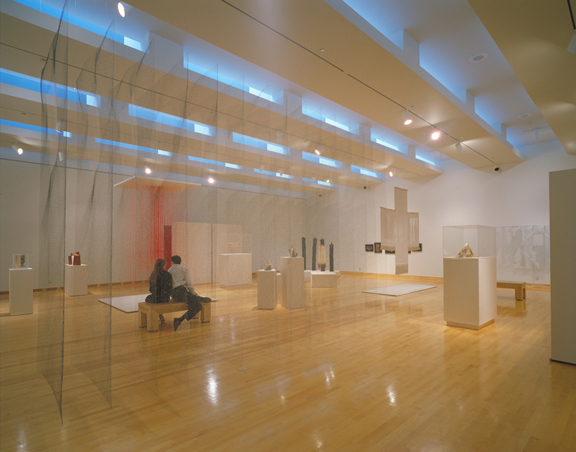 The gallery sequence is open ended; visitors can use the sculpture terraces to explore inside and out, or they can proceed indoors to the large upper gallery, which has the highest ceilings and straddles the main entry. At the center is the Galvin Playhouse with The Dance Studio Theater. The curving arcade/aqueduct delivers water to three fountain locations, one of which is at the theater entry. The theater is reached through the foreground arcade, which has aluminum louvers that form a trellis. The color graduates from light to dark, ending with purple-black side walls inside the theater. The poetry of Garcia Lorca describes the desert dualities "sol y sombra." 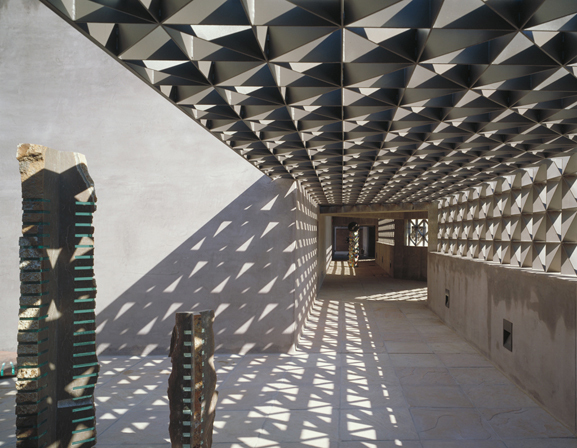 This building acknowledges those aspects of the terrain, both spiritually and physically. Necessary respites from the sun are created by zones of lacy shade, like the patterns palo verde leaves cast on the desert floor. Spiky trellis elements help to cool spaces both cavernous and labyrinthine. Another journey extends to the sky, via terraces and balconies toward towers that define the west campus entry as a gateway. 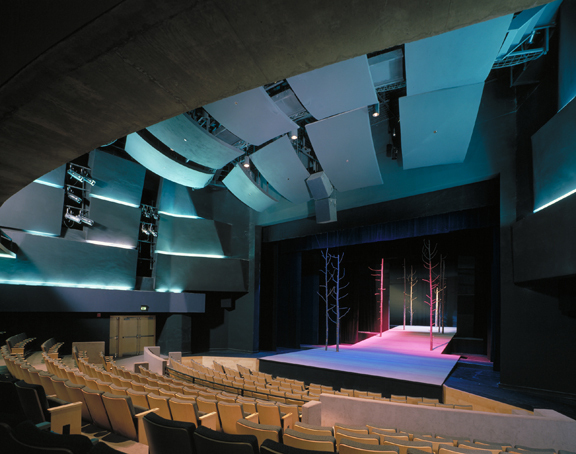 There is both an ascent and a descent from the middle ground, where the theaters and the theater arts spaces are located. 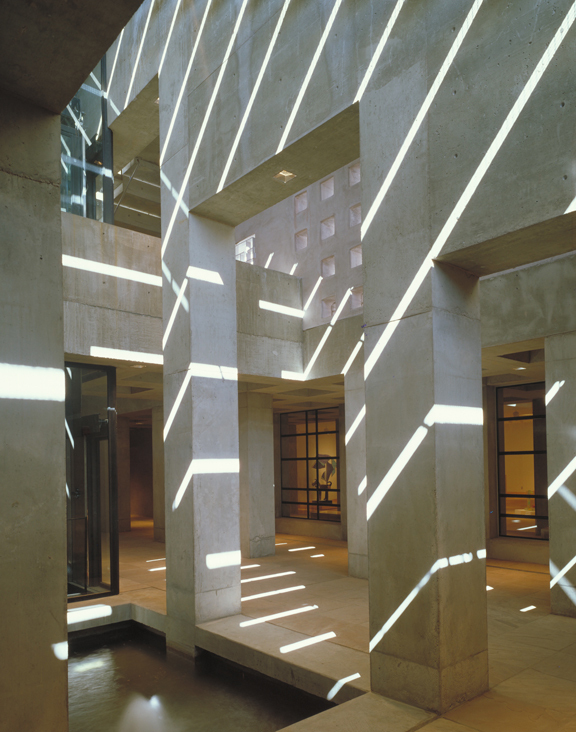 The multiple journeys are possibilities that become trails as each visitor experiences the building.